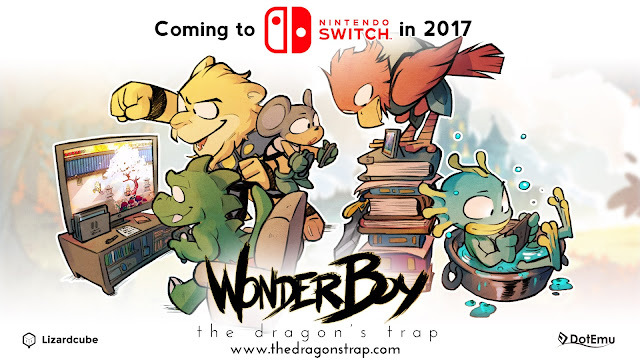 Home / Nintendo / pc / playstation / reviews / videogames / xbox / Wonderboy: the dragons trap. Feels a bit like a zoo out there! 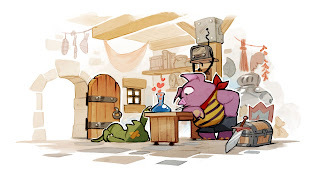 Wonderboy: the dragons trap. Feels a bit like a zoo out there! In 1989, in the shadow of the mega success of Nintendo NES, while kids lay in their beds trying to play one more round of Tetris on their gameboy with the help of the moonlight peering through their curtains, SEGA Master System saw the arrival of WonderBoy 3 ( or 4 by Japanese standards), the dragon's trap. Though not as well known as the Zelda's and the Mario's of the time, WonderBoy is still considered a cult hit and worldwide acknowledged as a classic. 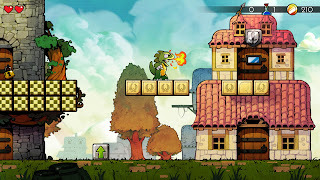 Twenty eight years later studio Lizardcube took their love for the game and worked with the WonderBoy series creator Ryuichi Nishizawa to bring the game back, polished and converted for the current age. 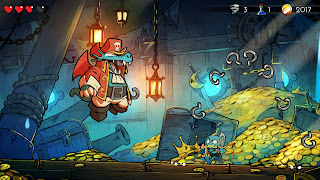 WonderBoy the dragon's trap is a loose open-ended platformer, not unlike to what is often referred to as a "metroid-Vania" style game, with a little bit of mega man added to the mix. A true 8-bit era platformer with backtracking, exploring, un-lockable areas, and some light RPG elements thrown in to boot. The story is quite straightforward as many games were at the time. The opening takes place right at the cliffhanger ending of its prequel WonderBoy in monster land. 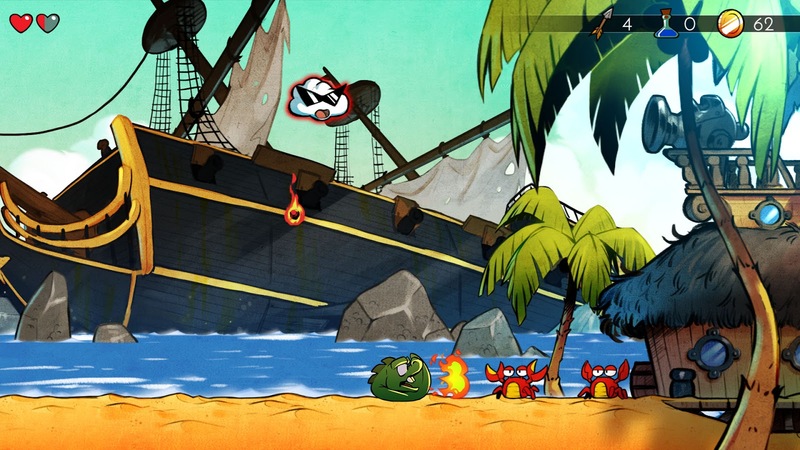 By defeating the Evil Meka-Dragon, WonderBoy seems to have released it's evil grip on the land. But what he had not expected was one final curse the dragon had left, transforming WonderBoy into a half-man,half lizard figure. Now instead of relaxing and enjoying a good time off , WonderBoy must once again face many challenges in search for a cure. On his adventure he must defeat many enemies, avoid traps and go through many more transformations (a Lizard, a Mouse, a Piranha, a Lion, and a Hawk)on the way back to his former self. One thing that is clear from the moment you start the game. This is the same game you played in 1989, same levels, same enemies types etc. There are no new game mechanics and there is not much in the way off a tutorial, though some text at the bottom as times gives you a hint or two and one of the npc's, a pig sitting in the town church gives you some cryptic hints on what to do next. Most of the time the game leaves you to figure things out on your own. But if you have played a game before should be able to move along just fine. Bad case of dragon breath. After a brief introduction that takes you through the fight against the Meka-Dragon of the last game, you find yourself as a half lizard mutant in a small town. Due to your limited powers there will be many places you cannot access at this time, and it is up to you to explore the world unlocking its secrets and powers in order to travel beyond those out of reach places . There are special consumable weapons such as boomerangs, tornados, arrows and lightning bolts that you can collect during the game by killing monsters. Though you might not use these all the time, they can come in handy in a pinch. Your health is indicated by the traditional hearts health bar which deplete each time you get hit, In the beginning you will have just one heart, but you will find more throughout the game as you progress. In the fight against the monsters standing in your way,the game also has shops that offer a limited selection of weapons and armor. These additions make you stronger and more resistant to attacks, adding some very light RPG elements to the game. It must be said it is not always clear how much each upgrade really helps you, but there is a noticeable effect on damage taken and enemies are defeated quicker, leaving you sweet, sweet coin to buy more upgrades. While are exploring it is important you keep an eye out for areas you cannot reach yet for one reason or another. 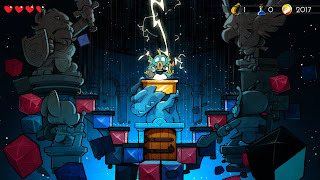 When you traverse the levels you will encounter a number of bosses whom, once defeated, transform you into yet another creature, each with their own unique abilities. As you gain access to better weapons and these new animal forms over the course of the game those hard to reach places become accessible to you. The death system is interesting in this game,when you die, and you will die, the game removes all consumable abilities you collected, but you get to keep all your upgrades, animal forms and coin as it re-spawns you back in town. Due to a lack of mid level save systems this often means starting back over, which can feel a bit punishing when trying to clear a level. But as you get stronger the levels feel easier to handle and the runs get easier. Overall the game plays very well, even though some floaty handling and hitbox placements can cause some frustrating at times when a well planned jump or attack seem to miss for no clear reason. Enemies have different colors to indicate their toughness, but it is not always clear how tough and at times it feels some consistency is missing. I am not sure if that is due to fact the enemy had the wrong color/stat combo or something else. The addition of the use of the old save code system is very cool, but it does do much in term of adding more or better saving options. Even though it's original holds up pretty well for its age, the folks at Lizard cube bring the game into the new age with amazing crisp and colorful cartoon characters that feel like a comic book come to life, while staying faithful to many of the original designs. In fact the game allows you to switch between the 8bit version and the new version at the flick of a button and it is fun to compare what the original was like and then to see what it became. When playing the game, the kids were instantly drawn to the game and were impressed when witnessing the switch between old and new style. In the end though the new graphics are too awesome to turn off other than the nostalgia factor. . The only character that was a little disappointing is the lion, the new redesign looks more like bear and it missing the beautiful mane you would expect for the king of the jungle. Similar to the graphics overhaul, the game also received brand new audio to go along with it, the sound effects are pretty basic and work well, but what stand out the most is the soundtrack. Just as with the graphics stayed true to their original designs, so did the soundtrack. New arrangements of the 8-bit originals were drawn up by Micheal Gyre and recorded with real instruments, creating a much more organic feel that is very pleasing to the ear and never tiring to keep listening too while playing. With an ESRB rating of E(for Everyone) 10+, the game is an excellent option for a family environment. I suppose the 10+ rating is because of the animate violence ( you hit creatures with a sword) and some NPC's smoke. But it is nothing that is very obvious and depending on your family rules it can be a game that can be enjoyed by all ages, with only some challenges in term of gameplay obstacles, the game is just such a pleasure play or watch. The added option to play as WonderGirl does not change much in the game other then your human form, but it is a welcome addition to choose from. As someone with daughters I can always appreciate seeing a girl as the hero of the story. As gamers, especially older gamers we are getting spoiled this year with some wonderful releases of games that either revisit old familiar places or reintroduce styles of art or gameplay of days gone by. WonderBoy: the dragon's trap continues this current stream of fun little games and brings one of the best remakes of the 8-bit era in a long time. At just under $20 the game is offered at a fair price point, but keep in mind it is fairly short and can be probably finished in a long evening or at least over weekend by most reasonably experienced gamers. With no multiplayer and no random dungeons or additional levels the only reason to replay will be because you had so much fun the first time around. Therefore replay value is quite low for most that complete this adventure, but the entry price is still worth the experience. Whether you are looking for a nice filler game, a beautiful show piece, a fun traditional style platformer or a trip down memory lane, WonderBoy:The Dragon's trap is a title you cannot miss!